Like the Google Adwords traffic estimator, the Facebook Ad creation interface is designed to help advertisers target and scale their cost-per-click (CPC) campaigns. 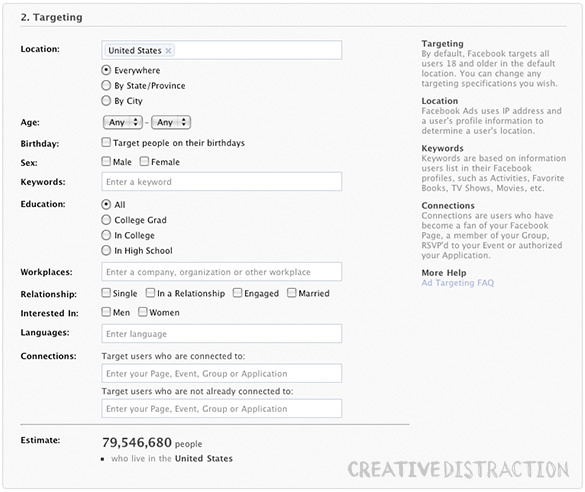 In doing so, it provides a number of targeting filters that generate estimates of the total number of Facebook users meeting given criteria. This data has obvious utility to advertisers. But as Facebook’s enrollment grows to encompass effectively everyone and the company offers increasingly granular targeting filters — as of mid-July, advertisers can target users on their birthday! — the estimator tool itself may become a useful tool of market and social sciences research. For my project, I was interested in Facebook’s penetration into U.S. audiences by year of birth, and so I whipped up the quick chart below comparing the data from the estimator to Census estimates. I’m looking forward to more creative uses of the Facebook Ad targeting tool as it grows and changes. And probably some incredibly ordinary CPC campaigns, as well. Jonathan, not much to say, except thanks for the interesting post. It’s amazing to me the data sources available out there, I did not know about this one. That’s some amazing saturation for the late 80′s crowd! I really love data. I’m not kidding. I have spent the past year or so exploring the intersection of Applied Behavior Analysis and visual culture. The notion that I could piggyback on top of FB to reach a captive audience without having to commit to the daily grind of blogging was appealing. Having a home base on the web allows room to blast the information through a number of different portals. The question for me is how to expand the “friend” base, to attract people who may have an interest outside of my usual sphere. Jerry Saltz, the art critic for NY Mag, has accomplished this quite successfully. He posts a provocative comment, links to an article, and the replies roll in. It’s pretty amazing. Incidentally, the term, “Facebook Penetration” is hilarious. @Bruno and @Stephen, thanks for the comments. To save our dear readers the hassle of Googling it, here is the link to Jerry Saltz’s column: http://nymag.com/nymag/jerry-saltz.